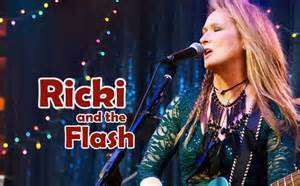 When the best acting in a movie starring Meryl Streep is done by Rick Springfield you know the film “Ricki and the Flash” is in trouble. Unlike other scenes where either screen writer, Diablo Cody, and/or the director, Jonathan Demme, were afraid to go one step further and make it interesting, the one between Streep and Springfield is emotionally moving. Meryl Streep is a has-been who never was. She left behind three children to pursue her music career to become a rock star moving to California from Indiana and now many years later is called home by her ex, Pete played by Kevin Kline, because their daughter, Julie, played by Streep’s real life daughter Mamie Gummer, was left by her husband and he feels she needs her. Unbeknown to Ricki, who real name is Linda Brummel, her daughter also tried to commit suicide and is in therapy. Pete has remarried and Maureen, Audra McDonald, along with Julie, live in a gated community McMansion. Ricki/Linda is broke, works during the day for a Whole Food-like business as a cashier and at night she and her 4 man Flash crew are the house band who play mainly to an older crowd with the bartender the youngest person and is devoted to Ricki. With strong actors like Streep, Kline and McDonald the scenes between them lack the force that is needed to make them count. When McDonald and Streep face each other you expect sparks to fly but they just don’t. Kline and Streep have a mild high on pot---how 60s--scene that doesn’t go anywhere. The time between Ricki/Linda and her not completely accepting of her gay son, Adam, played by Nick Westrate or her and her about to be married son Josh, played by Sebastian Stan, who though holding affection for his mother doesn’t want to invite her to his wedding are so low keyed they seem to be in another movie. he fact that Ricki/Linda is a Republican Obama hating conservative with a US flag ‘don’t tread on me’ tattoo on her back is put out there and then nothing is done with it. Too many times there are musical interludes where there should have been exploration of the dynamics between the movie’s characters. The Hollywood ‘happy ever after’ ending isn’t earned nor does it really make any sense. With a $17 million budget and Streep’s name it will probably make money!